Conveniently store any number and size of supplies. Perfect for stacking or wall mounting. Sturdy white plastic cabinet with 9 transparent drawers, each approx 4-3/4"W x 5-1/2"D x 2-1/2"H.
Overall dimensions are 14-1/4"W x 5-1/2"D x 8-1/4"H.
Drawers can be easily divided for added storage use. 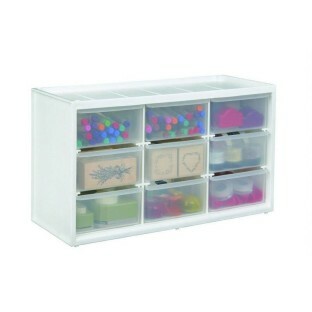 Conveniently store any number and size of supplies. Perfect for stacking or wall mounting. 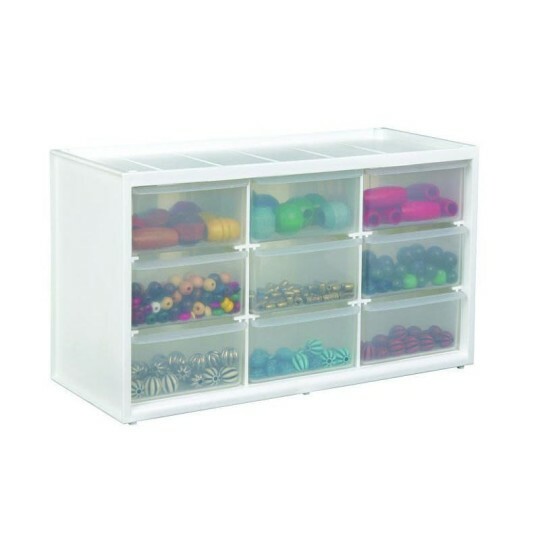 Sturdy white plastic cabinet with 9 transparent drawers, each approx. 4-3/4"W x 5-1/2"D x 2-1/2"H. Overall dimensions are 14-1/4"W x 5-1/2"D x 8-1/4"H. Drawers can be easily divided for added storage use. Contents not included. The drawers are nice sized but extremely loose. My beads have fallen out more times then I care to mention. I would have returned it if it weren't for the shipping cost.